For this trip, my companion and I decided to take the Amtrak’s Acela from Washington, D.C. up to New York City. True, we do live only minutes away from the giant Dulles airport, and it’s also true that the air shuttle isn’t terribly more expensive than train tickets. And fighting weekday traffic into the city’s Union Station was a hassle. But once on board, it seemed like a pure pleasure compared to the hurly-burly of airport screening. No stripping down for the metal detectors, no loading/unloading all our electronic devices. On top of that, the seats are roomier and there’s no limit to what you can carry on. So the trip up was great. The trip back … well, I’ll get to that later. For the first time we stayed in SoHo, and I was looking forward to exploring that area of the city. But our first priority was getting securing subway passes and heading out to the Bronx. My companion watches the Yankees lose. 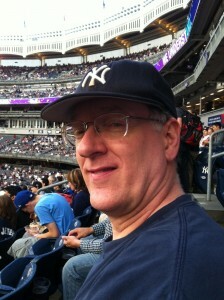 Now, it’s true that the Yankees have never won when I’m in one of the several stadiums I’ve seen them play in. 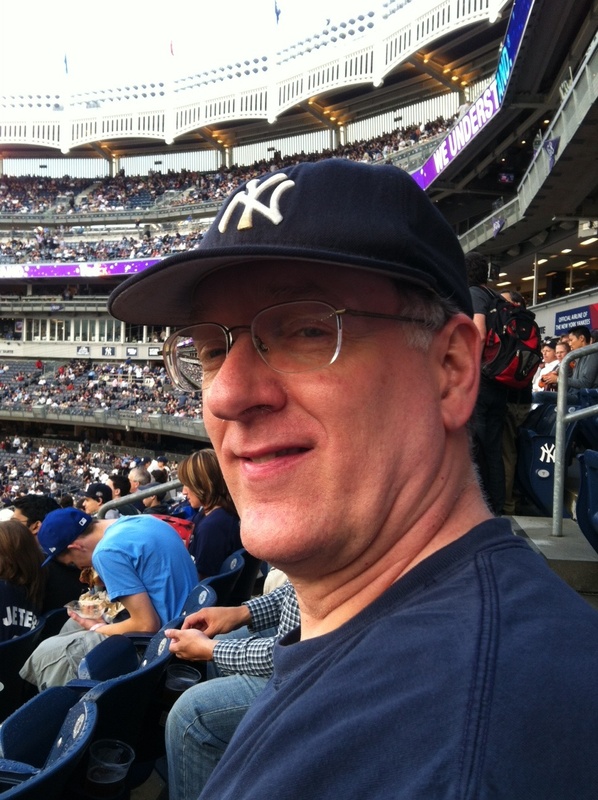 And it’s also true that during my one and only visit to old Yankee Stadium the Yanks set a record losing to the Red Sox (17 to 1.) And yes, it is also true that when I crossed the threshold of the new stadium the other night, the sky turned black and rain fell like a monsoon. And, OK, when they finally did play ball, the Yanks did lose to the Rays 7 to 3. But that doesn’t mean I’m a jinx. In spite of what my companion’s blog may tell you, just let me say: 1. It’s not my fault that Yankee managers don’t know when to pull their tired pitchers. 2. I’m a Yankee fan myself! My mother grew up in Bayonne, and taught all her kids to root for the Bombers. 3. And finally, if the Yanks can’t win just because a plump, middle-aged woman is sitting in the stands, well, they’ve got bigger problems than me. 4. Whatever you read in my companion’s account of the Yankees and me, remember, he’s inclined to hyperbole. Because of the rain delay, it was a late night, so I was glad to sleep-in the next morning. My companion was up and out and on to his business, but I was happy to go exploring on my own. SoHo is full of funky little shops, art galleries, restaurants and bakeries. It was a fresh, almost cool morning after the rain the night before, and lots of people were out, having coffee at sidewalk tables or picking flower bouquets outside the green grocers. Close to Mercer Street there are a few chain stores — J. Jill, Coach and the like — but generally the area has a nice, easy going, neighborhood feel. (Well, as laid-back as NYC gets, anyway.) I was happy to find a Nespresso store to have brunch and spend some time sampling espressos blends. I spent well into the afternoon walking, window shopping and working off the buzz. That evening when my companion returned, we went out to a little place called San Marino. It was a soft, cool night, perfect for sitting outside. The white wine was crisp and properly cold. The pasta was al dente and the service was that rare balance of attentive yet unobtrusive. And the price? Oy. One thing about New York: Nothing, absolutely nothing, is cheap. I couldn’t help wondering what Joe Alsop would think about today’s social media. One of his lines in the play goes something like, I don’t care what people want. I tell them what they need to know. It’s unlikely he would have indulged much in community engagement. After a play so steeped in journalism, it seemed entirely fitting to meet a young friend for dinner at a little Greek place in Hell’s Kitchen called Uncle Nick’s, where we toasted his new job at the New York Times. He’s a good hire – just as passionate and dedicated as Halberstam and the Alsops were in the their day. Word drifted through the ranks that a cable on a bridge around Aberdeen, Maryland had gone out and was under repair. More trains had been summoned, but there was no word (or promises) about when they’d arrive. As more people arrived to catch southbound trains our line just kept growing. My companion and a guy in front of us quickly summed it up. We weren’t going anywhere, anytime soon. Within half an hour I was in the back seat of a rental car, my companion in front of me and the gentleman, whose name is Alan, behind the wheel. But my companion does travel outrage so much better than I. I know he’s blogging about the snafu right now. I’ll let him fill you in. This entry was posted in New York by Mimi Johnson. Bookmark the permalink.